This gem of a cap features the logo of an NHL Throwback team. The Kansas City Scouts were an NHL franchise located in Kansas City, Missouri. You may know them as the present day New Jersey Devils. In between the two destinations they also had a brief 6 season stay in Denver as the Colorado Rockies (1976-1982). The Scouts which called the KC area home for two seasons won 27 out of 160 games played; Needless to say a less than stellar history. The Scouts were one of two NHL expansion teams in their first year of play along with the Washington Capitals. The franchise played their home games in Kemper Arena. After the franchise left for the Rockies, big league hockey was never to return to Kansas City. There were a few stints of minor league teams, but nothing big to speak of. Through the trials and tribulations those who wore the scouts jersey laid the foundation for one of the most notable NHL franchises of the last 30 years (The New Jersey Devils). It just goes to show you that everything has to start somewhere. 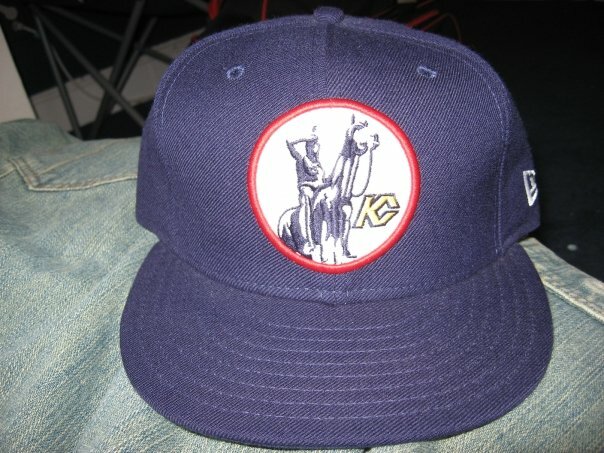 The cap shown has a navy blue crown and brim with a red circle and white inside displaying a Native American on a horse seemingly scouting out territory on the horizon. Awful franchise, great history after Kansas City, and a cool logo. Hats featuring the Scouts logo can be found at the link below. Enjoy! Apple Pie, and Baseball, thats what America does.